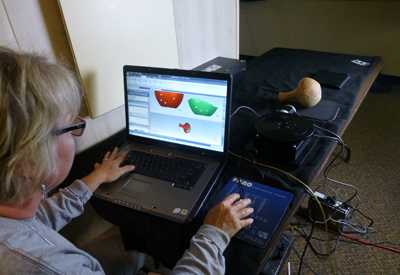 AIST uses the latest 3D technology to preserve world heritage. TAMPA, Fla. -- The Alliance for Integrative Spatial Technologies (AIST), part of the College of Arts and Sciences at the University of South Florida, will be a guest curator of MOSI’s exciting new exhibit, “3D Printing the Future - The Exhibition.” The exhibit, which opens June 14, will illustrate 3D printing’s boundless and mind-blowing potential to reshape how we live, work and play. AIST is no stranger to 3D printing, and they have built an international reputation of being a leader in 3D technology. AIST will be showcasing how it uses 3D printing to preserve world heritage in the exhibition's archaeology section. AIST will illustrate how ancient sites and artifacts are brought to life in surprising detail and show how scientists are using 3D printing and scanning to advance our understanding of ancient people, places and animals. The College of Arts and Sciences and AIST also will help to bring exciting speaker series events and technology demonstrations that will give hands-on and interactive learning about 3D printing. “3D Printing the Future” will offer an inspiring glimpse of the future through 3D-printed objects, live demonstrations and hands-on 3D printing, along with an in-depth look at how 3D printing technology works, how it is used and the amazing possibilities for the future. “3D Printing the Future - The Exhibition” is a limited engagement and is free with MOSI admission and included in MOSI membership. MOSI admission, which includes “3D Printing the Future - The Exhibition” and a documentary IMAX film, is $22.95 for adults, $20.95 for seniors (60+) and $18.95 for children (2-12). Museum hours are Monday – Friday, 9 a.m. to 5 p.m. and Saturday and Sunday, 9 a.m. to 6 p.m. For more information, call (813) 987-6000 or visit mosi.org.